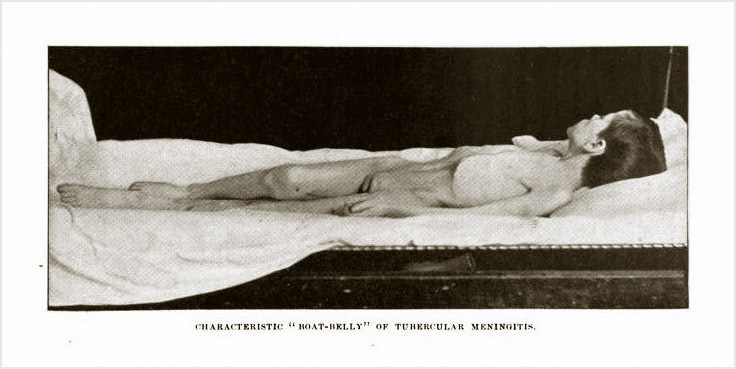 The "boat-belly" of tubercular meningitis. A clinical report. Description : 548-550 p. [1 l.] pl. ; ill.: 1 phot. ; 24 cm. Photograph : photoengraving (process unverified). Photographer : Henry Granger Piffard. Subject : Meninges — Tubercular meningitis. Author caption: BY V. P. GIBNEY M.D., Surgeon-in-Chief to Hospital for Ruptured and Crippled New York. M.D., Bellevue Hospital Medical College, 1871. Appointed to Hospital for the Ruptured and Crippled, 1872-1885. Co-organizer, New York Polyclinic, 1882. Professor of orthopedic surgery, New York Polyclinic, 1882-1892. Surgeon-in-Chief, Hospital for the Ruptured and Crippled, 1887. Cofounder and first president, American Orthopaedic Association, 1887. First professor of orthopedic surgery, Columbia's College of Physicians and Surgeons, 1894-1917. President (second term), American Orthopaedic Association, 1911. Photo caption: Characteristic "Boat-Belly" Of Tubercular Meningitis. Eponym: Gibney perispondylitis—painful fibrositis of the spinal muscles. Several orthopedic devices and dressings are associated with his name. Index Medicus: 21007081150, 20602051210 (offprint). My object in reporting this case is not to add anything new to the literature of tubercular meningitis, but to call especial attention to one of the characteristic and well-known symptoms of the disease, which is present in nearly all cases at some time or other; sometimes present during the entire disease, again only present for a day or two, and at no certain period. I refer to the retracted abdomen or " boat-belly." So far as I know, no attempt has heretofore been made to illustrate this symptom by means of a wood-cut, and the advantages of photography in portraying disease are well shown in this instance. For the excellent photograph, taken by means of flash light, from which the wood-cut was copied, I am indebted to my friend Dr. H. G. Piffard, of New York.—Page 548. Represented by the photograph is a comatose 12 year-old boy with the hollow scaphoid abdomen once associated with tubercular meningitis before the advent of antituberculosis compounds. The masterful image was taken a few hours before the child's death and it was executed by Dr. Henry G. Piffard (1842-1910) by means of his new flash light process. Piffard was a director of the New York Association of Amateur Photographers and is credited with important practical improvements to flash light photography that he made public in October 11, 1887. The accomplished Piffard also took the first photographs of lightning, published the first monograph illustrated by flash light photography, an atlas of skin diseases, and he later contributed to the research of tuberculosis.